Sleep extra guests on the pull-out sofa sleeper in the living room, which also features a 37” flat screen HDTV with DVD player. Guests can relax after a busy day in the deep soaker tub in the full bathroom, which also features a shower and double sinks with a granite countertop. To suit your specific needs, we offer two types of Deluxe Suites: Queen and Twin. Both the Deluxe Queen and Deluxe Twin Suites offer a fully-equipped kitchen, with an oven, a stove, a full-size fridge with a freezer, a dishwasher, a microwave and a coffeemaker, as well as cookware, dish ware, glassware and cutlery. In the bright dining area, the glass-top dining table seats four. Sleep extra guests on the pull-out sofa sleeper in the living room, which also features a 37” flat screen HDTV with DVD player. The Deluxe Queen and Deluxe Twin Suites also have an additional bathroom, complete with granite countertops and a deep soaker tub/shower. 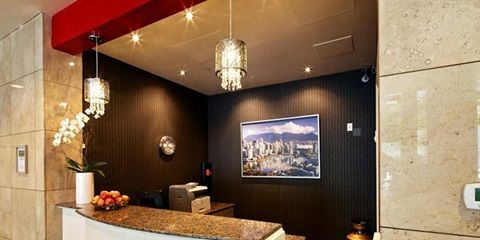 Our most spacious accommodation options, the penthouse suites offer sweeping city and mountain views and the very best in-suite amenities and features. 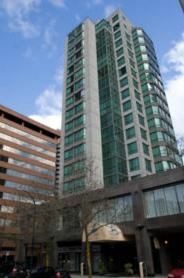 To book a one- or two-level penthouse suite, please contact Vancouver Serviced Apartments directly. Wireless & high speed Internet access. Complimentary Continental Breakfast served on the 2nd floor from 7am to 10:30 am. Fully equipped kitchen. Microwave. Refrigerator Dishwasher. Voice mail & data port. Guest rooms wired? & wireless internet access (free). Complimentary newspaper Monday to Sat. In room coffee & tea.